In this tutorial we're going to use the mouse and keyboard emulation abilities of a variety of Arduino devices combined within infrared receiver to make a remote control mouse with some keyboard commands thrown in for good measure. There are a variety of reasons why you might want to create an infrared remote control mouse or keyboard. Suppose you're making a PowerPoint presentation and you don't want to be stuck standing next to the laptop as you click through the slides. Or perhaps you've set up your Raspberry Pi as a media server or you have some sort of Home Theater PC connected to your TV. However for me the ability to do mouse and keyboard remotely is much more personal. As a result of my disability, I cannot use a traditional mouse. I control my computer using dictation software. However the mouse commands for that software have limits or are somewhat inconvenient to use. I can however use a traditional TV remote by poking at the buttons with a stick in my mouth. I originally developed this project because it helps me overcome my disability and allows me to do productive things like write tutorials for the Adafruit Learning System. If you're interested, here is a link to my personal blog about how this project was originally developed. I use it every day and I could not have written this tutorial without it. We originally intended this tutorial to have support for Pro Trinket as well as any ATmega32u4 based boards such as the Arduino Leonardo, Arduino Micro, and Arduino Yun. However there appeared to be some conflicts between IRLib infrared library and the Pro Trinket mouse and keyboard libraries. If we can resolve those problems at a later date we will update this tutorial. For now we are sticking to the ATmega32u4 based boards. We will be using Arduino Micro however the code will work identically with an Arduino Leonardo and the Leonardo portion of the Arduino Yun. You will need an IR sensor such as the TSOP38238 shown at the right. You will need some sort of infrared remote control. All of our example code has been written for the Adafruit Mini Remote Control shown on the right but you can modify the code to use any ordinary TV remote if it uses a protocol supported by IRLib. Although it is not 100% necessary, we will also add 2 NeoPixel's as indicator lights that will help you know whether or not you are in mouse mode or keyboard mode and if you have pressed the Control, Alt, or Shift buttons. The NeoPixel also indicates whether or not you are dragging the mouse or clicking it. 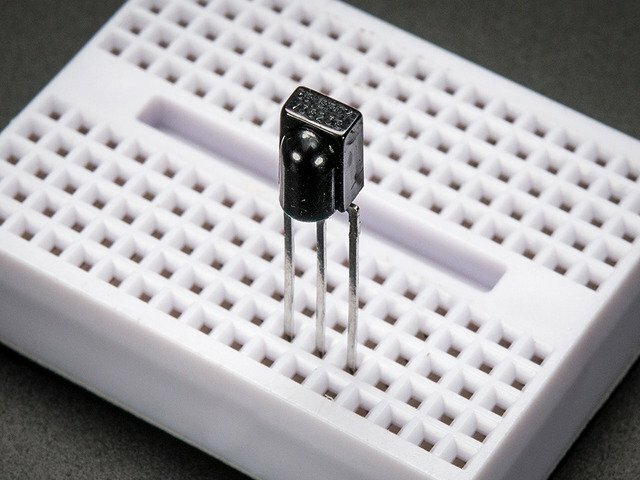 You also need the IRLib2 Infrared Library for Arduino available on GitHub.. For an introduction to using this library, see our previous tutorial Using an Infrared Library for Arduino. NOTE: These tutorials have been updated for use with IRLib 2.x which is not backwards compatible with the original IRLib 1.x. 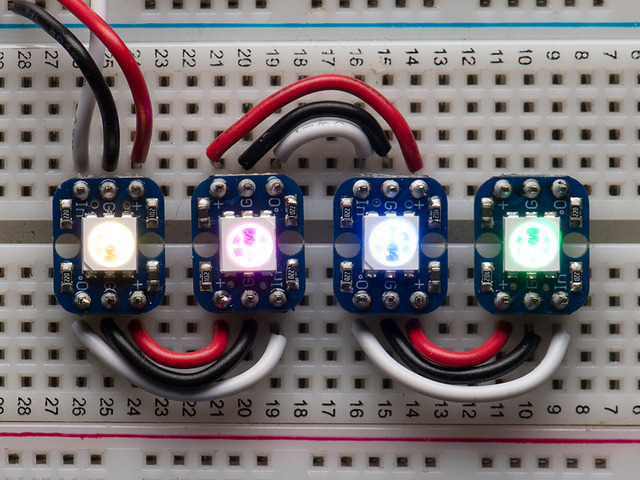 If you're using NeoPixels as indicator lights you will need down eight the Adafruit NeoPixel Library from GitHub. Both of these libraries can be downloaded using the buttons below. See the tutorial All About Arduino Libraries on installing the code into your Arduino Integrated Development Environment (IDE) for your use. If all we need to do is move the mouse around and click it using the left click button then you really only need to assign five buttons on your remote to the up, down, left, and right mouse movement functions and the click function. Most remotes have a series of four arrow keys with a select button in the center that can be used for clicking. We however are going to go above and beyond and assign as many functions as we can to the Adafruit Mini Remote Control. We are also going to define two different modes of use: one of them for mouse commands and the other for a limited set of keyboard commands mostly arrow keys. The full source code can be found in the next page of this tutorial. Here is an illustration of the commands that we are assigning to the 21 buttons available on our remote. Some of the commands are duplicated in both mouse mode and keyboard mode. You switch modes by pressing the "8" button which is at the lower center of the remote. 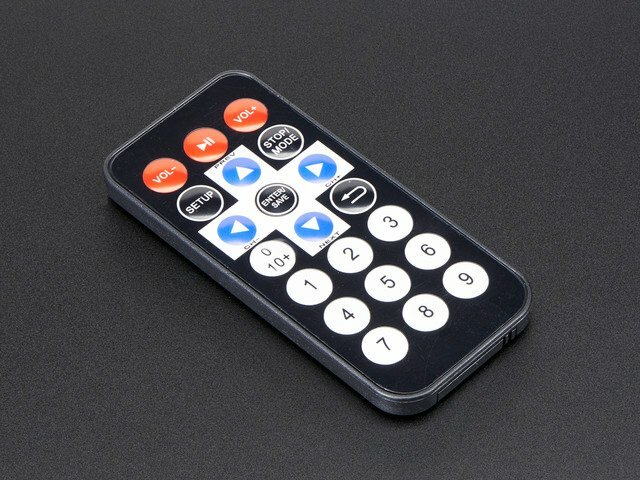 If you are using a different remote, you will need to come up with your own layout assigning buttons to functions. You may not want to assign all the buttons we have assigned or you may come up with additional ones that you would like to use. Below is a section of the code we will use. It defines the 32-bit hex values that are transmitted by the various buttons on the remote. A complete source code listing is given on the last page of the tutorial. Five of the buttons are available in both mouse and keyboard modes. The three buttons across the top are toggle keys for the Alt, Control, and Shift keys. When you press them once, it holds that modifier key until you press again. You can also press "5" marked "Rls" for "Release". It releases all of the toggle keys as well as releasing any held down mouse buttons for dragging. In addition to the three modifier keys and the release button, the mode switch button "8" is also available in both modes. Because the keys are toggle keys, I found it easy to forget whether I left the shift key held or not. That's why we need the NeoPixels. The first NeoPixel tells you which mode you are in. If the pixel is off you are in mouse mode. If it is green you are in keyboard mode. If it is red you are holding or dragging the left mouse button. If it is blue you are holding or dragging the right mouse button. The second NeoPixel indicates key modifier status. Red means Alt is being held. Green means Control is being held. Blue means Shift is being held. If you are familiar with how RGB colors are mixed you can also keep track of multiple conditions. For example if the second pixel is cyan (a mixture of green and blue) you know that both control and shift are being pressed. The arrow keys are used by both mouse and keyboard. Their function is obvious. In mouse mode we can also move the mouse diagonally using the "Set Up", "Stop/Mode", "Enter/Save", and "0 10+" buttons. In keyboard mode these correspond to Home, End, Page Up and Page Down functions. There are special buttons to change the speed of the mouse. You can scroll the mouse wheel up and down. You can click using left click, right-click or you can drag using left drag or right drag. If you're using a different remote then we are, you will have to determine the codes for your particular remote. In the IRLib "examples" folder is a sketch called "IRrecvDump". You can load that sketch, point your remote at the receiver, and get a dump of the codes zero serial monitor. Once you have changed all of the codes to suit your remote, you can upload the IRmouse sketch to your device. This guide was first published on Apr 14, 2015. It was last updated on Apr 14, 2015.